And they blew a massive lead in historic fashion with his absence. The Los Angeles Clippers rallied from a 31-point deficit to stun the Warriors, 135-131, and tie the series at 1-1. The win marks the largest comeback in NBA playoff history after the Warriors led, 94-63 with 7:31 remaining in the third quarter. Golden State entered the fourth quarter holding a 108-94 lead, but Lou Williams led the furious late comeback in a 36-point, 11-assist effort while Patrick Beverley continually harassed the Warriors on the defensive end. The Clippers outscored the Warriors, 41-23, in the final stanza and took their first lead since early in the first quarter when Landry Shamet’s 3-pointer dropped through the net with 16.5 seconds left for a 133-131 edge. 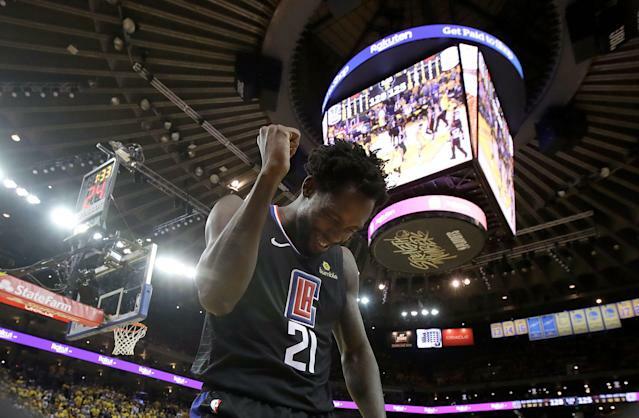 Stephen Curry attempted to answer on the other end, but when his 3-pointer with 9.3 seconds clanged off the rim, Montrezl Harrell secured the rebound for the Clippers, essentially ending the game. Los Angeles completed the comeback as Warriors star Kevin Durant watched from the bench. With 1:21 remaining, Durant backed into a screen set to get Curry open for a 3-pointer with Golden State leading 128-126. Officials whistled Durant for his sixth foul, sending him to the bench after he turned the ball over with the illegal screen. Durant briefly protested the call but ended his argument, seemingly aware of the consequences of picking up another technical foul after drawing two in Game 1 of the series. A player is suspended for one game after picking up seven technical fouls in the playoffs. Williams tied the game at 128-128 with a jumpshot after Durant’s offensive foul before Curry answered with a three on the other end to retake the lead, 131-28. But Williams hit another jumper before Shamet’s go-ahead three proved to be the difference in the game. Durant reportedly left the locker room along with Draymond Green without granting interviews. Cousins suffered his injury while chasing down a loose ball in the first quarter. He fell down without being touched and clutched his left thigh before eventually limping off the court to the locker room. He’s scheduled for an MRI on Tuesday. ESPN’s Adrian Wojnarowski reported that the team is concerned that Cousins suffered a torn quad and is holding out hope that an MRI reveals that it’s just a strain. While there was no early long-term diagnosis for Cousins, Warriors coach Steve Kerr didn’t sound optimistic when talking with TNT’s Kristen Ledlow during an in-game interview. Cousins returned to action midway through the season after a torn left Achilles suffered while playing with the New Orleans Pelicans last season left him sidelined for several months. Cousins averaged 16.3 points, 8.2 rebounds, 3.6 assists, 1.3 steals and 1.5 blocks in 30 games this season for the Warriors. 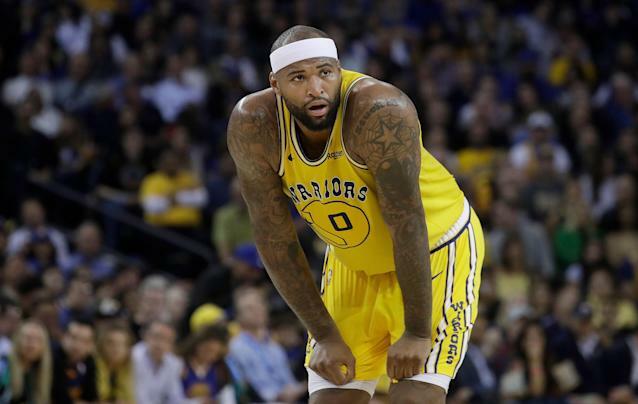 A four-time All-Star and two-time All-NBA center, Cousins is playing on a one-year deal in Golden State after suffering the Achilles tear that came at the end of an expiring contract. This year has been a chance to show what he’s still capable of after missing out on a likely max contract because of the Achilles injury. With Cousins out, the Warriors will look to Kevon Looney and recently signed Andrew Bogut at center. TNT’s Charles Barkley, whose final NBA season ended prematurely when he suffered a ruptured quadriceps tendon, sent well wishes to Cousins during halftime. "I just hope he's alright."